Barnes 4WD B4W25003BP - Anti-Wrap Leaf Spring Perch Pair, Dana 60, Ford 8.8 & Ford 9"
Spring Perches are not a one size fits all item. 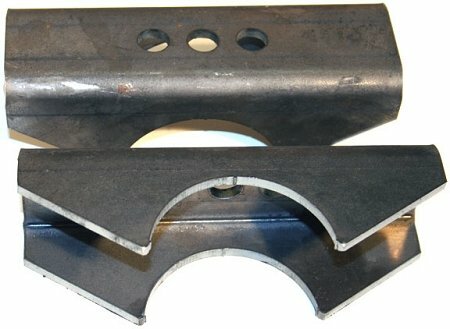 These perches are specially made for ,Dana 60 , Ford 8.8 & Ford 9" applications they are precut for a 3" to 3 1/4" axle tube and are bent for a 2 1/2" wide spring. These perches are not comparable to other perches that are made from thin material. Our perches are made from ¼" thick plate steel that is laser cut and then formed on a CNC press brake, this ensures that the spring perches are right every time. All of our spring perches are 7 ¾" long to prevent axle wrap and have three mounting positions to make your wheelbase adjustable up to two inches. Like all of our products, they are made in the USA from USA steel. Sold in pairs. View More In Leaf Springs & Parts. If you have any questions about this product by Barnes 4WD, contact us by completing and submitting the form below. If you are looking for a specif part number, please include it with your message.